We hear phrases like “the one” so often throughout our lives that it can begin to lose meaning. What does “the one” mean? What about the signs of true love? Are we talking about classic romance like Romeo and Juliet, or something more modern like Harry and Sally? What does”the one” look like? What do the signs of true love even look like? The real answer is that while characteristics for “the one” may be different for everyone, there are some fairly consistent signs of true love that have remained consistent across generations and continents. Though some people may not believe in Soulmates or even one great love for everyone, there are some key things to look for when choosing a person that will hopefully be your partner for life. Here are some signs of true love that indicate that you are at least headed in the right direction. The definition of compromising is “mutual concessions,” or basically being able to agree on a decision. If your partner is willing to compromise his or her life choices in order to make yours work, things are going very well. There are plenty of relationships that have ended due to new jobs, relocating, friendships, issues with each other’s family, and so on and so forth. If you are in a relationship that knowingly tackles those tough subjects, you are doing very well. If neither you nor your partner are willing to compromise with one another, you may subconsciously not even want this relationship to last.The final score in such cases will be—Signs of true love-0, Signs of impending breakup-1. Having people in your life that will always root for you to succeed is incredibly important. We’ve come to expect these things from our parents, our siblings, and our best friends but we should also expect these things from our partners. If your loved one is constantly encouraging you, supporting you, and almost literally standing on the sidelines cheering for you—you have a keeper on your hands. Everyone is different and that is more than okay, however there are some issues that are just not worth looking past. Interests are different than morals. If you and your partner don’t like the same football team, or he likes documentaries and you like feature films, nobody’s getting hurt. If you two don’t see eye-to-eye on major political issues, or major religious issues, or how to raise children—things are a bit trickier. It is definitely okay to be with someone from a different background than your own but if you two cannot love and respect and understand one another on a moral level, you may need to reconsider. There are the things that people need to feel loved. These things are different depending on who you are and how you respond to companionship. Personally, I am not interested in gifts. Admittedly, I think flowers are wonderful and of course I like the gesture of someone thoughtfully buying something specifically for me, but in a relationship, this is not how I feel loved. I would much rather have my partner take a night off, rent a movie, and spend a few uninterrupted hours with me than buy me something nice. Diamonds are pretty, but quality time is the best. If you and your partner understand the things you each need—quality time, gifts, acts of service, physical touch, or kind words—than you have a much clearer sign that you are “the one” for one another. Though I think young love is absolutely heartwarming, there is something about a seasoned dater that really speaks to me. You can definitely stumble onto the signs of true love at a young age, but it is much more clear as you get older and have already experienced enough relationships to know exactly what you are looking for. If you meet “the one” when you’re over 25 years old, you might have a stronger sense of self, much more confidence, and greater insight into what you have been looking for throughout these years. Sure, anyone can move in with each other, but there is something about wanting to live together versus living together out of necessity. Everyone appreciates their alone time on occasion which means if you are willing to sacrifice being alone for being with one another, you have a great relationship in your life. 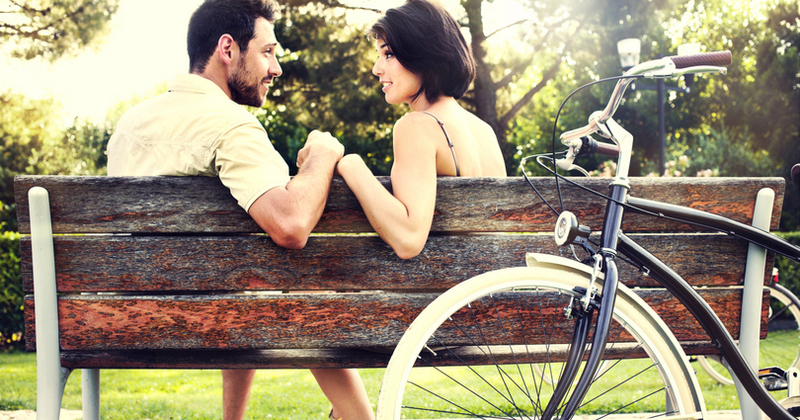 If he or she is “the one,” you will want to spend your time—and space—with one another. I don’t know many people who enjoy crying in front of other people. If you and your partner are freely able to discuss your problems (in your relationship or outside of it) without hesitation or fear of vulnerability, congratulations! You are with “the one,” or at least with someone that you feel wholly comfortable with. Crying is hard but if you can cry (or laugh!) without feeling embarrassed, you are with the right person for you. Not all functional relationships will have this quality, but if you can achieve it, your relationship will be stronger for it. It is wonderful when you are with a partner who loves and respects your friends (and vice versa), but it is even better when your friend groups come together. You know you are with “the one” when he or she wants to merge your lives in all aspects that make sense for the two of you. The couple that travels together stays together! A clear sign that you are with “the one” is if you are willing to take fun adventures with one another. You’d backpack around Europe with your best friend, right? If you can’t imagine committing to such an excursion with your partner, you might not be with the right person. Book some trips with your “one.” You will have a great time. One of the surest signs of true love and that you are with “the one” is a lack of drama. Most of us have had relationships in the past that seem to focus on dramatics. Turbulence and passion are two driving factors in a lot of relationships and though there can be perks to feeling all of those feelings, there are even more perks in finding security. You know you are with “the one” when you two can disagree quietly, discuss the issue, and solve it without drawing in third parties. You are with “the one” when you feel calm, comfortable, and secure. You are with “the one” when you are not questioning his or her motives about everything in your lives. Drama is good for a story, but confidence is good for a lasting relationship. The last on our list of signs of true love and finding “the one” is the natural lining up of future plans—you get bonus points if you and your partner already share a willingness to make life plans that include the other person. Even without planning a future together, though, you still may find some similarities. Things like wanting an advanced degree, having children or even moving to an island can be things you both may have wanted separately before, but now they’re so much better because they’re shared by the one you love. Don’t worry if you don’t see the signs of true love in your relationship. Don’t worry if your relationship doesn’t fit the bill for all of these points. No one has a perfect relationship and no one ever will. If you feel happy, secure, comfortable, and safe—you are likely with the right “one” for you—at least for now, and hopefully for forever.